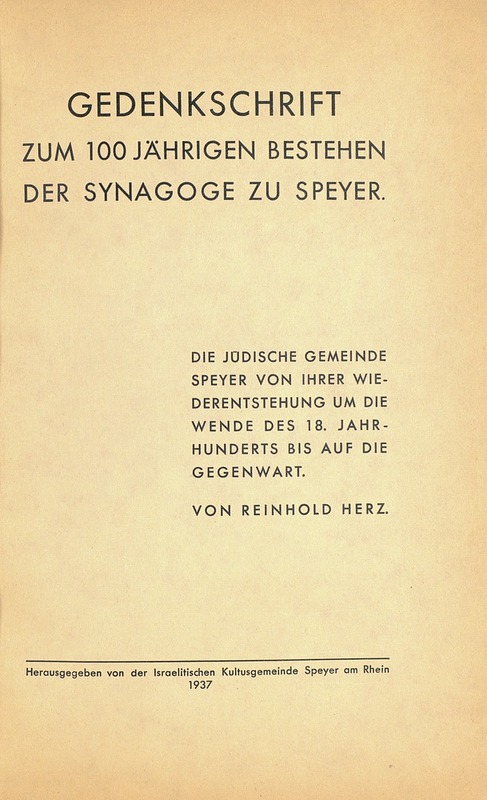 This commemorative work celebrates the 100th anniversary year of the Speyer synagogue founded in 1837. 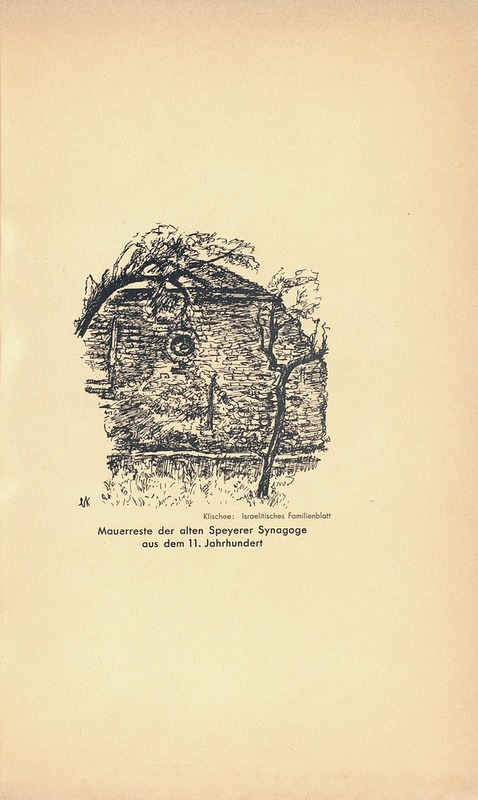 The documented existence of a Jewish community in Speyer dates back to the 11th century. Indeed, Speyer was considered one of the most important Jewish communities in Europe up until the 13th century when a series of pogroms wiped them out entirely. The Jews were banned from settling in Speyer in the 15th century, but a royal charter in 1544 allowed for their return. Between the 16th and 18th centuries, only individual Jews lived there, but by the end of the 18th century a new community was established. A synagogue for this community was built in 1837 on the site of a former church, and the Jews of Speyer flourished and grew to over 500 members. With the rise of the Nazis, however, the number of Jews in Speyer fell to 269. As their cultural associations and youth organizations were banned and their businesses boycotted, many Jews fled the city. This scarcely available, historically important work includes a history of the community in the 19th and 20th century, as well as photographs of the former synagogue. 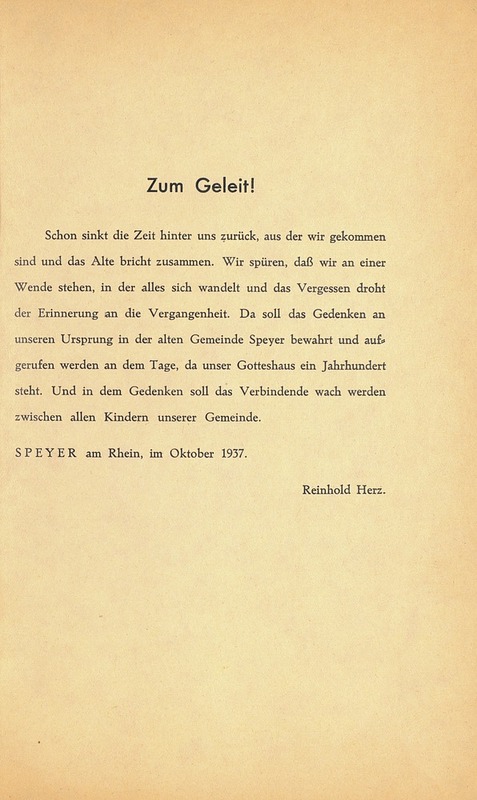 In the last few paragraphs, the writer laments the state of the now diminished community and calls upon the entire Speyer community – those present and those remote – to remember their ancient link to Speyer and to remember the synagogue as a way to connect with each other through time and space. 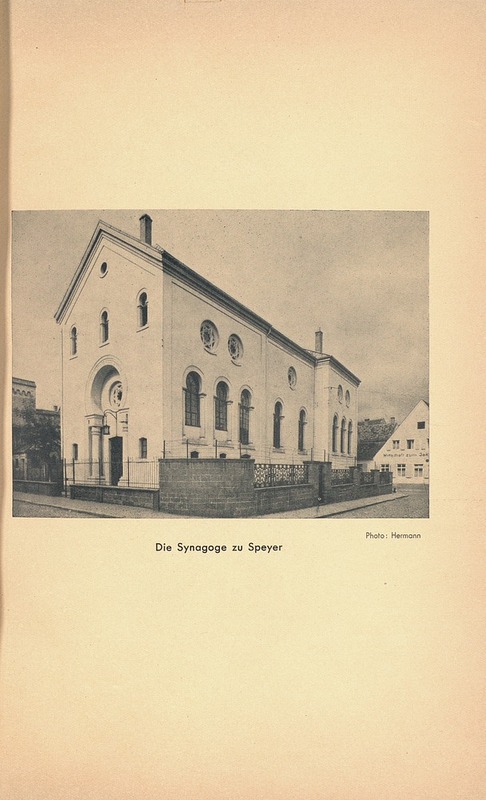 The Speyer synagogue was looted and burnt down during Kristallnacht in 1938. In 1940, three years after this work was published, the 51 remaining Jews were deported to concentration camps and murdered.